It is middle managers, not workers, who need to be given the most encouragement to make the construction industry a safer, heathier place to work, a study has concluded. The research by the Constructing Better Health occupational health pilot scheme found it was managers who were hardest to convince about the benefits of occupational health services. The pilot, which worked with more than 360 employers from October 2004 to June 2006, was designed to test the extent to which occupational support for the construction industry could offer demonstrable benefits. During the pilot, more than 1,700 workers attended voluntary health checks, and 2,600 went along to “toolbox talks” providing training on occupational health issues. 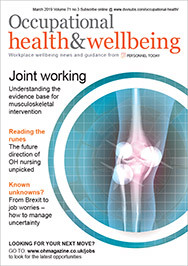 A third had occupational health issues as a consequence of noise and vibration, while a third were also found to have general health problems, most commonly related to high blood pressure or respiratory issues. Overall, around 600 people needed to be referred to a GP. Complex subcontracting relationships and casual employment meant employers often did not see absence as “their” problem or something they needed even to record. “Similarly, workers may feel financial pressures to come to work even when in other sectors they would be considered too ill to do so, which can store up problems in the longer term,” said Tyers..